Here in OKC, our dental team understands very well that dental emergencies are inconvenient by nature. When these scary situations happen, already having a trusted dental team in your family’s corner can make a world of difference! 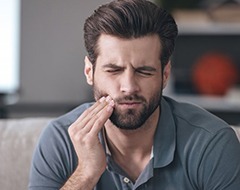 Please don’t hesitate to contact Joe Isaacson Dental immediately to request an urgent visit if you’re grappling with severe oral pain and/or an injured tooth. Dr. Isaacson will make every effort to accommodate you as soon as possible, providing much-needed relief. Why Choose Joe Isaacson Dental for Emergency Dentistry? These types of injuries can happen when you’re least expecting it – maybe you’ve tripped on the sidewalk while walking to work, or maybe someone’s elbow accidentally slammed right into your mouth while playing around with the kids at home. Whatever the circumstances are, experiencing a broken or knocked-out tooth can induce panic at a moment’s notice. First of all, we strongly urge you to remain calm and pick up the phone right away, as there is a small window of time for traumatized teeth to be successfully preserved and restored. If the tooth has been completely dislodged, try to place it back into its original socket and hold it there – otherwise, carry it in a container of milk. If facial swelling occurs, the use of a cold compress can help reduce the uncomfortable effects. 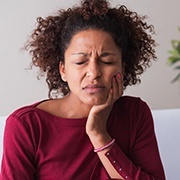 Severe pain and/or sensitivity in a specific tooth is likely the cause of an advanced dental infection brought on by ineffective brushing and flossing at home. In order to rescue the tooth and help it stay a stable part of your smile, Dr. Isaacson will likely recommend root canal therapy. If you’re unable to reach the practice right away, it is safe to take Aspirin to manage the pain in the interim but be careful NOT to place the medication directly on the gum tissue, as this could cause burning. Dr. Isaacson has been practicing dentistry right here in Oklahoma City for well over two decades now, and his tried-and-true experience, advanced training, and genuine dedication to his patients’ wellbeing are all second to none. 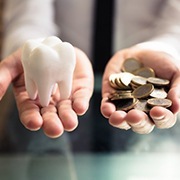 When dental emergencies strike, he will do everything in his power to provide treatment as soon as possible – no days or weeks of waiting in vain. He offers several advanced services that can help patients successfully recover from even the most severe situations, including state-of-the-art dental implants, root canal therapy, mercury-free dental crowns, and more. Root canals may have a “scary” reputation, but today’s advanced technologies and comfort techniques have helped make it more pleasant and successful than ever before! The procedure is simple enough – Dr. Isaacson will carefully access the tooth’s inner pulp chamber, eliminating the diseased bacteria that’s causing a severe “toothache” and thoroughly cleansing the structure. Many teeth treated with root canal therapy are able to stay stable and healthy, remaining in the patient’s smile for many more years to come.